The issue of hierarchical organization of cognitive practices – revealed by postmodernist critics – still influences on the interaction between science and religion. The formation of new (post-narrative) type of coexistence between discourses is important for the problem of correlation between scientific and religious ways of knowing the world. The problem can be considered through the analysis of historical interactions between science and religion in the light of the concept “rationality”. We investigate the question of possible definitions of rationality in different cognitive practices by the comparative and conceptual analysis of the Stepin’s conception of historical change of scientific types of rationality (classical, nonclassical, and post-nonclassical), as well as the ways of relation between science and religion in Haught’s (conflict, contrast, contact, collaboration) and Barbour’s (conflict, independence, harmony, dialogue, integration) conceptions. The “classical rationality”, in this analysis, is appeared to be as producing the conflict between science and religion, the “nonclassical rationality” – as founding their independence (contrast), and the “post-nonclassical rationality” – as enabling the active interaction between them in different ways (contact, collaboration, dialogue, integration). We explain the historical change of types (or ways) of relation between science and religion from the point of interval-continual approach, which combines the view on continual nature of truth with the idea of truth as revealing exclusively within a certain conceptual and theoretical interval. Thus, the dialectic of rational and non-rational is appeared to be as historical change of types of relation between science and religion. We conclude that the development of the dialectic goes from the hypostatization of epistemological dimension of rationality to the recognition of ontological dimension of rationality. That is why interval-continual approach can be used as еру theoretical basis for a description of possible ways of relationship between science and religion. Keywords: faith, interval-continual approach, rationality, reason, religion, science, truth. The history of Russian studies in Italian though dates back to the turn of the nineteenth and twentieth century; but for now Italian philosophy remains terra incognita for Russian researchers. This article presents the origins of this historiographical tradition. The author describes the philosophical dispute between Boris Jakovenko and Benedetto Croce over the status of ideas in Russian philosophy; she gives some critical consideration of Vladimir Ern’s historical and philosophical works on Italian thought (about А. Rosmini-Serbati and V. Gioberti) providing a comparative study of G. Gentile magister thesis “Rosmini and Gioberti”, and Ern’s work “Rosmini and his Theory of Knowledge”. In addition, the article contains information about the key-philosophical figures, issues and specific trends of two important periods in the development of Italian thought: the Risorgimento period and the beginning of the 20th century (when a number of Italian philosophical movements, intellectual circles and journals were flourishing). 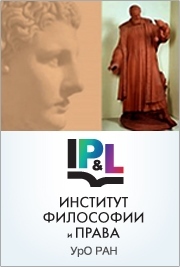 Keywords: Italian philosophy; Russian philosophy; V. F. Ern; B. V. Jakovenko; Russian studies in Italian philosophy; Russian historiography; A. Rosmini-Serbati; V. Gioberti; G. Gentile. This paper is dedicated to the study of «stability» ideas existing in the political sphere as one of the key points of official political power discourse. According to the author, the usage of “stability” concept oriented towards various manipulations of the public opinion is compared with the scientific notions expressed in domestic and foreign developments. The paper includes a comprehensive methodological optics: the author offers detailed analysis of the key contemporary concepts of “stability” with detailed presentation of the relevant requirements for the existing political order. The author makes a conclusion about the discrepancy between the meaning of “stability” in the scientific and political spheres. The paper considers such systematical political circumstances as defects in political communication and existing political language (1); political disenfranchisement and reproducing alienation of citizens from their own political rights and ideas about themselves as political actors (2); and as deliberate transformation of quite specific and instrumental discourse of “stability” and “stabilization” into a vague ethical requirement (3). The author assumes that continuing trends in Russian politics (in many ways similar to similar trends in other countries) – such as the gap between the establishment and the rest of society (a); political apathy and even depression of a large part of the population (b); and the ongoing transformation of the information space (c) – are able to exacerbate the problems of the official authoritative discourse with scientific research and even elementary common sense. Keywords: stability, political regime, discourse, language, political competition. institutions to a greater extent provide a policy of interests that expresses the aspirations of elite groups, but not the civil society. The author turns to the theory of deliberative democracy and associated concept of an aleatory democracy. He analyzes the potential forms of citizen participation in the implementation of public power based on the institution of draft (some forms of mini-publics). The article shows that the modeling of these forms is closely connected with the evolution of juries and, in particular, with the establishment of cross-sectional ideal in order to form their panel in the United States in late 1960s. The newest forms of aleatory democracy are considered. The author analyzes advantages and disadvantages of these forms, and experience of their practical implementation. He concludes that the forms of aleatory democracy to a large extent ensure rational communication between civil society and the state, as well as local self-government authorities. The development of these forms in the future can help to overcome crisis of contemporary liberal democracy. Keywords: aleatory democracy, deliberative democracy, jury, mini-publics, planning cells, citizens’ juries, consensus conferences, deliberative polls, citizen’s assemblies, clear citizen’s jury, citizens’ parliament, cross-sectional ideal, cross-sectional jury. frequent, often conjuncture changes. The subject of this is the detailed consideration of the two elements of the legal status of the specialized constitutional control bodies of the CIS countries. In this article, the author, using a comparative method of research, examines the order of formation of specialized constitutional control bodies of the CIS countries, singles out four ways of forming these bodies with a preference towards one of the methods characterizing a number of CIS states, which suggests that in determining the composition of the constitutional control body, not only the representative body (parliament), and the head of state, but also representatives of the judiciary from specialized bodies of the judicial community participates on the equal footing. Further in the article, the author in detail, and with the use of a comparative method of research examines the competence of specialized constitutional control bodies of the CIS countries, breaking it into two large groups of powers, namely, general and specific powers. Moreover, in addition to the powers, the author singles out and examines the rights of the specialized constitutional control bodies of the CIS countries. In conclusion, the author based on comparative analysis summarizes the most perfect order of formation of specialized constitutional control bodies, involving the maximum equal participation of all branches of state power, as well the ways of rationalizing their competence, which in the future can be used to improve the constitutional and legal status of the specialized constitutional control bodies in CIS countries, and other states. In addition, the author in more detail, formulates proposals for improving the legal status of the Constitutional Court of the Russian Federation in terms of expanding and specifying its competence.